Whew! It’s not hard to tell it’s the beginning of the year. I got some writing done, worked on promotional stuff, made a new short story available on a bundling site, set up a new bundle I’d like to curate, and poked around on Patreon for a while. I’ve been thinking about Patreon for some time now…is it something that could work for me as a writer? I’m leaning toward giving it a try, but no firm decisions yet. I’ll keep you posted here on any developments. I do have some fun things I could do on the platform, I think. 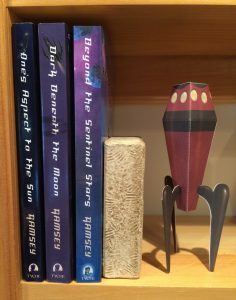 The big news this week is that my copies of Beyond the Sentinel Stars arrived! I think it wasn’t really real until I held a copy in my hands. Which also meant I was able to take this picture…full trilogy! This has also been my second week of doing a yoga practice every day and–wow! I am really feeling the effects (in a very good way). Of course I’m still at my treadmill desk, too, but the yoga is bringing something entirely new and welcome to my physical state. I discovered this wonderful channel on YouTube–Yoga with Adriene–and if you’re thinking you might like to try it, I can’t recommend her strongly enough. No pressure, no stress, no demands to do things perfectly or quickly. Adriene’s laid-back and restful style of instruction is exactly what I needed. Check out her beginners’ videos if you’re curious. Every day I can’t wait to get to the mat for my practice. Just for fun, this year I’m tracking what I research for various stories. Things I looked up on the Internetz this week for writing: old general store images, row houses, and words in the Mi’kmaq language. 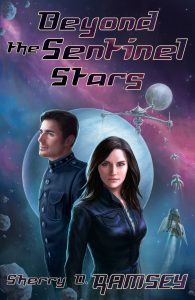 I’m super excited to reveal the cover for Beyond the Sentinel Stars, coming in December from Tyche Books! 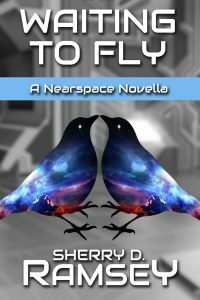 This is the third book in the Nearspace series, and you’ll find all the characters you love onstage again. The art is once again by Ashley Walters, who did a wonderful job of setting the scene for this novel. Luta and Lanar really look like brother and sister to me! What’s happening in Nearspace now, you ask? 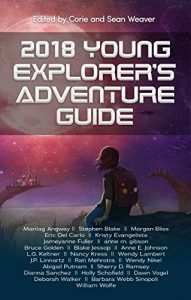 Luta Paixon and the crew of the Tane Ikai have made it back to Nearspace safely, but that safety is short-lived. As if a disastrous diplomatic mission to the crow-like Corvids isn’t enough, Luta’s old enemy Alin Sedmamin is back—and asking Luta to help save his life. In exchange, Sedmamin is offering secrets stretching back more than a century into Nearspace’s past—secrets that could prevent a war. 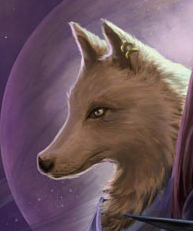 Meanwhile, Luta’s brother Admiral Lanar Mahane is faced with an awful truth: the Protectorate is spread too thinly across Nearspace to offer adequate protection or defense when the aggressive Chron turn their murderous sights on Nearspace again. They must forge new alliances if Nearspace is to survive, but it’s almost impossible to know who to trust. As interstellar conflict looms on the horizon and a political plot of tremendous scope and daring threatens to destroy Nearspace from within, Luta and Lanar will test the bonds of family and the strength of hope as they struggle to maintain peace in a world that seems destined for war. It looks like the official release date will be December 19th, but you can pre-order now at Amazon, Kobo, and Amazon Canada. Wow, pretty dusty in here. Looks like I’ve been away for the whole summer! Well, yes, I was. Not away from home (much), but away from my digital home. and from my office, too. That was messy enough to take two days to clean up, but that’s done, so I’d better clean up here, too. And I actually do have stuff to report, because I was back at my desk much more this week. First up: Over the summer, I turned in the manuscript for Nearspace #3, Beyond the Sentinel Stars. It’s been through edits and although I don’t have a definite release date to share with you yet, it’s coming! 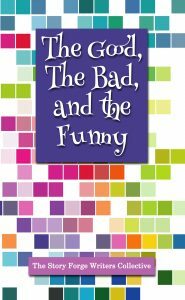 For those who love Luta and her crew, I think you’ll really enjoy this installment of their adventures. 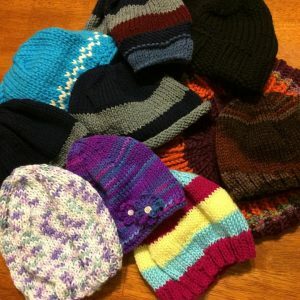 Next up: pre-orders are now open for the Gumshoes Bundle from BundleRabbit. If you’re a mystery lover, you won’t want to miss out on this one! 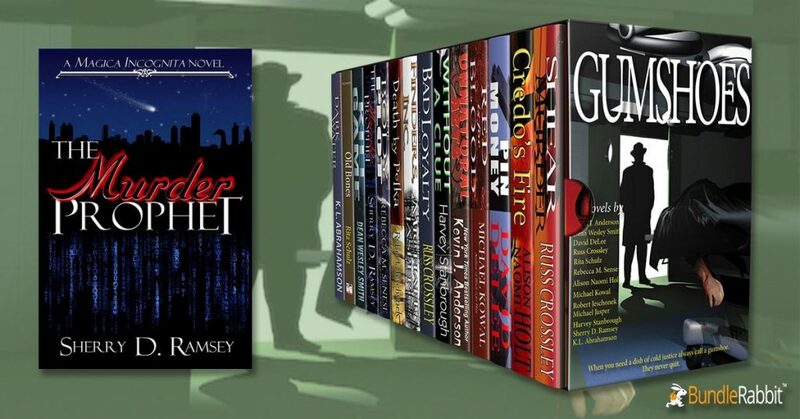 It includes my urban fantasy/mystery The Murder Prophet, as well as a host of other great titles. More news: Where Evil Dwells is out! 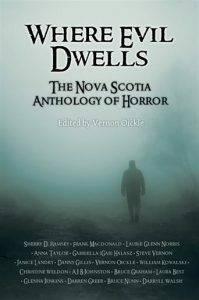 This anthology of Nova Scotia horror includes my story, “The Girl in the Stones,” and some other writers you’ll probably recognize. Available in stores and at all the usual online locations. One more thing for today: I’ll be at CaperCon 2017 as a guest, and I have a great lineup of panels and workshops! I’ll post details about them all here next week. 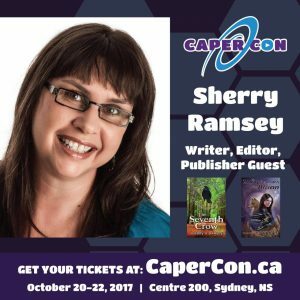 CaperCon runs October 20-22 and takes place at Centre 200 in Sydney this year, so plan to come by and visit! It’s set to be bigger and better than ever! The return of the Friday Desk Report! And look at that fabulously almost-symmetrical date. So, there hasn’t been a Friday Desk Report for a while, mainly because for the past couple of months they all would have read something like, “Tried to work on the novel edits this week in between bouts of feeling utterly depressed with the world. Drowned my sorrows in Guild Wars 2. Also, winter.” I mean, how many times would you want to read that? But here’s the good news: there’s actually news. I turned in the novel manuscript! I turned in the short story! 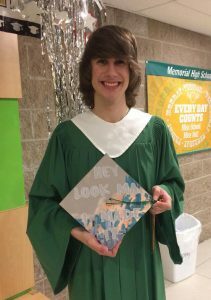 I edited and submitted another story! So things have really picked up again around the old desk. With luck, it will continue. I have a few new projects pestering me for some attention, and some older ones lined up in the “go back to” queue. Time to open up my year-out project planning spreadsheet and fill in some things for the next few months. I’ve also been asked to give a WFNS workshop this spring, which is exciting. We’re calling it “Exploring Speculative Fiction,” and I’m looking forward to spending a day talking genre with folks writing and hoping to write specfic stories. So over the next few weeks some of my desk time will be spent putting the workshop together. 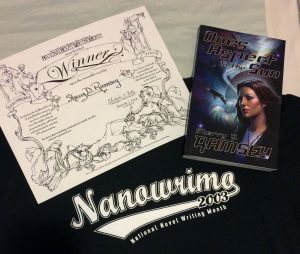 This was my second year of NaNoWriMo, and the year I wrote the first draft of One’s Aspect to the Sun. I learned a lot about novel-writing that year, including the fact that sometimes characters you intend to kill off in the second chapter just keep hanging around until you realize they’re not ready to die after all. I also found out how fulfilling it is to reach some semblance of an ending and type those two wonderful words. I wasn’t certain if this was the year I became a Municipal Liaison, but I’ve just gone and checked my email (yes, I’m an email hoarder, I confess), and this was the year I started. So I’m glad to have that figured out, because I’m never sure when filling out the ML form each year. It didn’t occur to me before this to just go and check those old emails, for which I really have no excuse. As I recall, we were a pretty small group that year, and far-flung across the Island, as we still are, although there are definitely more of us participating now. I remember mailing out pins and possibly stickers to a few participants. 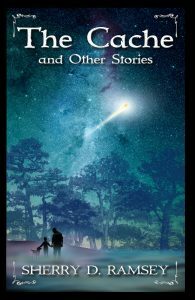 Anyway, this is a big year in the retrospective, because the draft I wrote this year became my first published novel (from Tyche Books) in…wait for it…2013. In November, even! Yes, ten whole years after I wrote that first draft. Now, I wasn’t working on it constantly during those ten years (I wrote a lot of other stuff in there, too), but I did write several drafts. I submitted it to the Atlantic Writing Competition (now Nova Writes) and took second place (which one of the organizers assured me meant that the novel was “publishable”), and rewrote it using the feedback I received from the judges. 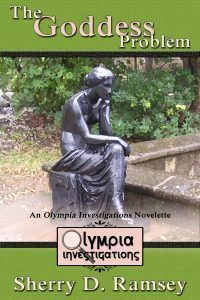 After a couple more rewrites and submissions, it found its home at Tyche. The beautiful cover art is by the talented Ashley Walters. The book was named “Speculative Fiction Book of the Year” by the Book Publishers of Alberta. When Luta Paixon, captain of the merchant trader Tane Ikai, looked in the mirror, she saw a woman in her thirties–even though she was actually eighty-two. 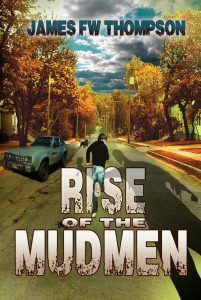 Luta’s only explanation might lie with the mother who had disappeared over sixty years ago. 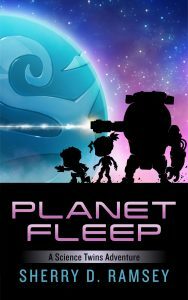 But even if her mother were still alive, it would be no small task to track her down in the vast, wormhole-ridden expanse of Nearspace. 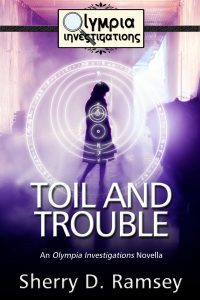 With the ruthless PrimeCorp bent on obtaining Luta’s DNA at any cost, her ninety-year-old husband asking for one last favor, and her estranged daughter locking horns with her at every turn, Luta’s search for answers will take her to the farthest reaches of space–and deep inside her own heart. Looking back at my spreadsheet from this year, I see that I finished November with a word count of 50,715. On the second day, my note says, “A little worried that I don’t know where I’m going,” but by the end of the first week I seem to have settled into a groove and flown straight on till morning. I actually finished on the 27th, averaging 1878 words per day. Which year will we visit next? Stay tuned! This is Cerevare, but you knew that, right? Sound delectable? Yes, I thought so, too, when I dreamed them up. So back to the cookies. The idea of figuring out the recipe has been simmering (pun intended) in the back of my mind for a while, but recently I felt ready to try it out. Now, unfortunately, I don’t have access to roga-nut spice from the planet Renata, and I suspect you don’t, either. 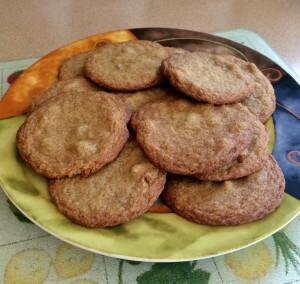 However, the recipe below uses a reasonable facsimile, and these are just about how I imagined Cerevare’s cookies. If you’re feeling like a literary treat today, give them a try! The recipe makes about 18 cookies and should double up just fine if you want a bigger batch. Preheat oven to 350 degrees. Cream margarine and brown sugar until smooth. Mix in the egg and vanilla–don’t over-beat, just combine it all. 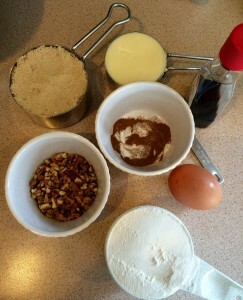 In a smaller bowl, stir the flour, baking soda, cinnamon, nutmeg, and salt together. Add the dry ingredients to sugar mixture all at once and mix just until everything is incorporated. Dough will be on the soft, wet side. Stir in the nuts. Shape into balls and place on a cookie sheet. I used a 1-1/2 tbsp. ejecting scoop for this and it made them the perfect size. 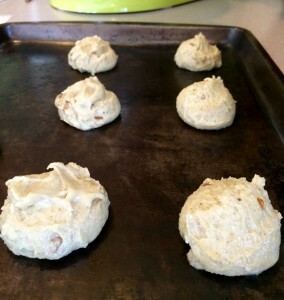 The cookies will spread out and flatten as they bake so leave lots of room between them on the cookie sheet. These actually turned out to be a little close. If you don’t want them to spread together, space them more than this! Bake for 8-10 minutes, until edges have started to look a bit crisp and wrinkly, but center is still soft. They should be a nice golden brown with darker edges. Take them out of the oven and leave them on the cookie sheet for a minute or so, then remove carefully (they’ll still be somewhat soft) to a cooling rack. They’re delicious with or without the glaze, but Cerevare does glaze them in the book. 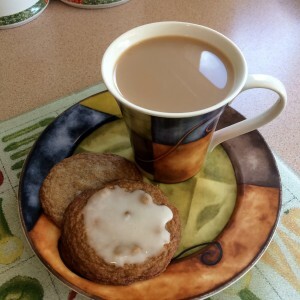 So if you’re inclined, mix up your icing sugar and milk (a slightly thicker glaze stays on the cookies better) and drizzle it on once the cookies have cooled a bit. (See above picture). Serve them up with your favorite caff, chai, tea, or other hot drink, whether it be earthly or interstellar. Let me know if you try them, and how they turn out! Another week when I was not at my desk very much–it was school book fair week here, so I spent a fair bit of time organizing and manning that. We had a good week and will be putting a lot of new books into the library as a result. 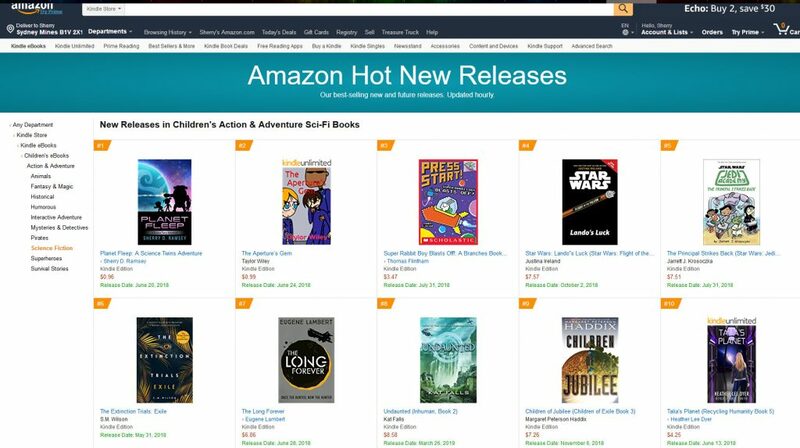 The other payoff is seeing the students get so excited about books. Not to mention dropping a certain amount of my own money there…but we won’t talk about that. …do you like it? Probably in next Friday’s report (or sooner!) I’ll tell you what the story’s about. So between editing the story, tweaking the cover, setting up the ebook formats, and miscellaneous other related tasks…that was the week. Add in meetings on three of the five weeknights, and it’s no wonder this isn’t a long report! 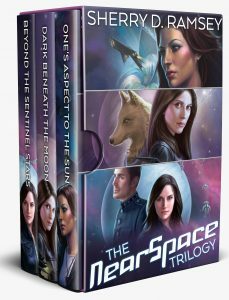 I do have one other piece of news, though, and it’s that One’s Aspect to the Sun will be part of a new Space Opera box set, also coming in March. Again, I’ll post all details and links as I have them. This is going to be a great deal, so you won’t want to miss out on it! And I think that’s the report.